"It's [aaa-reports!] time-saving functionality, ease of use and reliability in service led to aaa-reports! 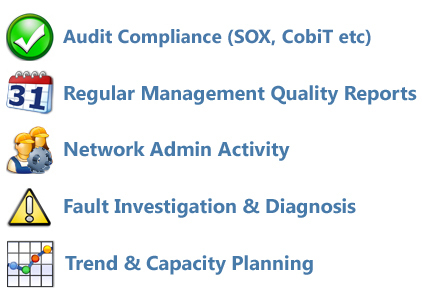 becoming an integral component of our network management infrastructure"
What do you need from your AAA server logs..? 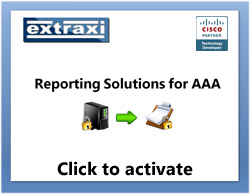 The extraxi aaa-reports! family of products has been specifically designed to help you with all of the above! aaa-reports! utilises the full power of a relational database to deliver a feature rich set of canned reports, custom reports, data filtering and much more. Version 2.2 now features support for Multiple back-end databases and Enhanced TACACS+ Device Admin (TDA) audit reporting - essential for documenting your ACS policy as part of an audit submission. Before we had aaa-reports! it took many hours to produce management reports. Now it takes minutes! Anyone that uses Cisco Secure, must also purchase aaa-reports! They will not regret it.